Whenever you are bored with regular roti, chapati for dinner, here comes the excellent paratha recipe which is diligently filled with flavors. 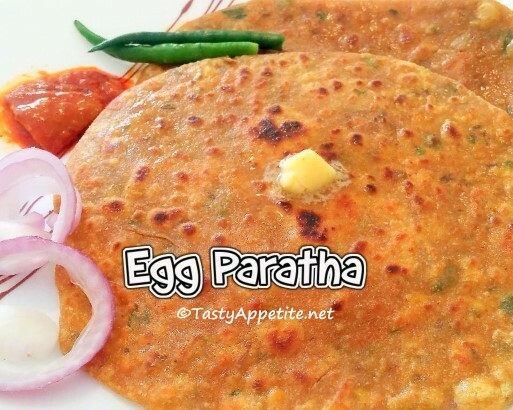 This stuffed paratha recipe is so easy to prepare and tastes simply out of the world. It is best served with mint chutney, yoghurt or pickle. Check out this easy video recipe and enjoy the healthy taste. Add 1 cup of warm water in mixing bowl. Add salt, cumin seeds, ajwain, turmeric pwd, red chilly pwd and coriander leaves. Add wheat flour and knead to smooth soft dough. Add oil and knead well. Add sliced onions and green chilly. Add turmeric pwd, red chilly pwd, garam masala pwd and saute. Beat eggs and add to the mixture. Scramble the eggs in high flame. Inner egg bhurji stuffing is ready. Take one ball, dust with flour. Roll it to thick small disc. Place 2 tbsp of egg bhurji and seal the edges of the disc as shown in video. Pat it flat and roll it to thick parathas. Repeat the same for all parathas. Place the paratha and fry on both sides, until it turns golden and cooked. Lipsmacking healthy delicious egg paratha is ready. Enjoy hot with yoghurt, pickle or any curry of your choice.